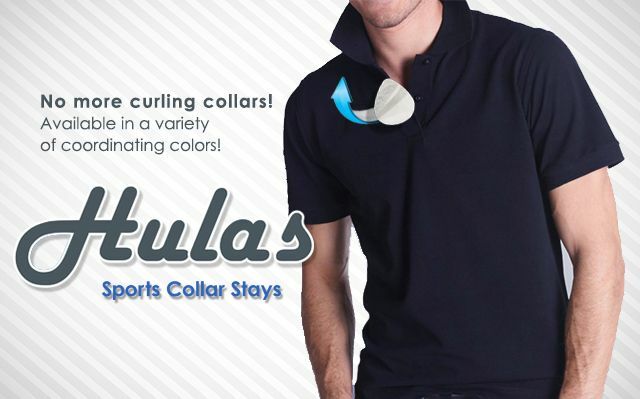 What are the benefits of using Hulas Sports Collar Stays? Are you tired of keeping your collar in place by curling and wilting it? Try out the new hulas collar stays. They help to keep the collar firmly in place and in no time at all, you will have the perfect look. Give your sports wear a fresh look by using them. You will be amazed at how neatly they fit beneath the collar and how firmly they keep it in place. What are Hulas Collar Stays and where to buy Collar Stays? When using sportswear the first thing that you have to check is the collar. While the body can be early ironed out, you don’t want to spend hours ironing out the collar. The best option to keep it in proper condition is by using a collar stay. Hulas collar stays are unlike the plastic and metal stays seen in the market. They are very easy-to-use. All you have to do is pull out the adhesive at the back of the stay and place it beneath the collar. These stays are invisible so no one will know that you are using them but the look that you get is really fabulous. Your collar looks neat and trim with an ironed out look. You can use the stay the whole day and maintain the same look. When you go for a sports meeting or an event, you need to look your best. With collar stays, you can get the best look without spending so much of time or efforts in the task. These stays will fit firmly beneath your collar and make it look sharp, keeping it in place even when you are wearing a blazer. You can use them for all kind of sportswear, which makes them really versatile. The best part is that one stay can be reused up to five times before the adhesive wears out. The wearing out also depends on the quality of the sports material. When you have to wash the sportswear, remove the collar stay. Do not wash the stay along with the material. Once the sportswear is ready for use again, reuse the same collar stay to get a sharp and smart look. Hulas sports collar stays are the best way to give your sports shirt a smart look. Gone is the time and effort spent in maintaining the look of your collar. In just a couple of minutes, you can get the perfect collar for your sporting event or meeting. You can buy hulas collar stays easily in online stores. These store offer hulas collar stays at very low prices enabling you to get more for less.